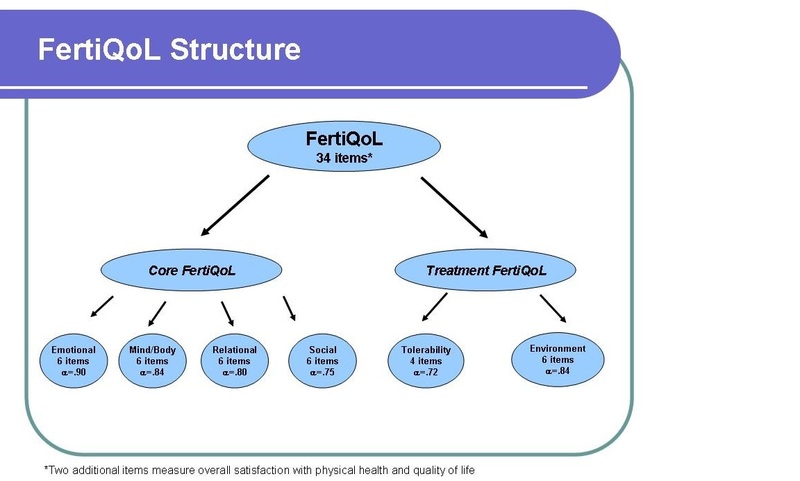 FertiQoL is relevant for anyone who feels they are experiencing fertility problems. People who do not currently have a partner can leave blank items about marriage or partnership. The optional FertiQoL Treatment module is relevant to people who have used fertility medical services (which includes any medical consultation or intervention). Responses to items are given according to ‘current thoughts and feelings’. It takes about 10-15 minutes to complete FertiQoL. Core FertiQol: A total of 12 items assesses the impact of fertility problems in the emotional (6 items) and mind-body (6 items) domains. The Emotional subscale assesses the extent to which the individual experiences negative emotions associated with the experience of fertility problems (e.g., jealousy & resentment, sadness, depression). The Mind-Body subscale assesses to what extent the individual experiences negative physical symptoms (e.g., fatigue, pain) and cognitive or behavioral disruptions (e.g., poor concentration, disrupted daily activities, delayed life plans) as a result of the infertility. A further 12 items assesses the impact of fertility problems in the relational (6 items) and social (6 items) domains. The Relational subscale assesses the extent to which components (e.g., sexuality, communication, commitment) of the marital relationship or partnership have been affected by fertility problems. The Social subscale measures the extent to which social interactions have been affected by fertility problems (e.g., social inclusion, expectations, stigma, support). Treatment FertiQol: Ten items assess quality of life during treatment, which includes any medical intervention or consultation, according to treatment environment (6 items) and treatment tolerability (4 items). The Treatment Environment subscale assesses accessibility and quality of treatment and interactions with medial staff. The Treatment Tolerability subscale assesses the experience of mental and physical symptoms and disruption in daily life due to treatment. The first internationally validated instrument to measure quality of life in individuals experiencing fertility problems.